Dedicated to welding, this website has all the resources you need to explore training opportunities and a career in welding. 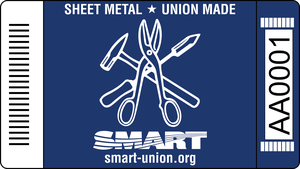 Members of SMART work to establish and maintain desirable working conditions for sheet metal workers through their efforts in government affairs, education, and communication. The association also maintains legal and jurisdictional departments for the benefit of its members. An internationally recognized association, SMACNA also develops industry standards and guidelines for component fabrication and installations. Contractor members of SMACNA write the technical manuals and standards for the sheet metal industry. A joint labor management trust, SMOHIT is dedicated to providing industry-leading health and safety solutions to minimize occupational illnesses and injuries for sheet metal workers. The trust focuses on health screenings and research on asbestos and other hazardous materials and offers training in health and work-related safety issues. The ICB directs a comprehensive set of certification programs to assure customers of the sheet metal industry of the quality advantages or utilizing persons or entities certified by the ICB. The SMART/SMACNA Partnership is more than 75 years old and is based on the mutual goal of delivering quality sheet metal applications and heating ventilating and air conditioning systems using skilled, trained, craft workers. The purpose of the Partnership is to maintain an effective cooperative effort to insure an increasing market share and dominant role in the future of the industry. The Label It, Scan It, Report It website is your one-stop shop for all the information and resources on the program you may need.